There are multiple components that go into creating advertising for your business, which can make ads more complex than you care to deal with. The complexity is creating a final product that blends your branding, promotional message, emotional value, and incentive all into one perfect call to action. Let us deal with the creativity, message, and testing of remarketing paid ads to get you the best results. Is your website being represented accurately through advertising? 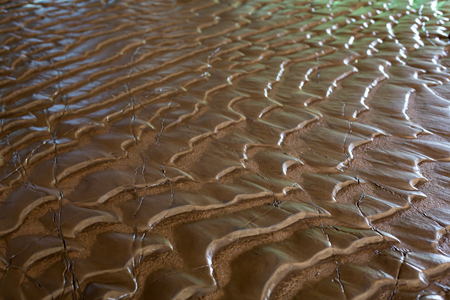 Remarketing allows you to “follow” people who have visited your Website, just like waves etched in the mud. Photo by Jeff Finkelstein, Waves from the Boulder Floods, Boulder Creek, Boulder, Colorado. The sole purpose of creating carefully designed and beautifully executed display ads is to extend your brand reach and gain more conversions for your website. It can be as simple as having high resolution logo images that keep your brand recognizable and high-quality. It can also be as difficult as getting your message across in few enough words while not compromising the ad space. There is nothing worse than a mobile ad where the company squeezes in too many words, taking the text down to a microscopic font size, which ultimately makes the ad completely useless. Through professional paid ad creation, our years of industry experience help your business succeed by knowing what does and doesn’t work for calls to actions and clicks to your site. The process starts with you and a lot of questions from us. Don’t worry if you don’t know the answer, they are always good questions that will help shape your business. In order for us to represent your business well through advertising, it is important that we understand your business and what it means to you and most importantly, what your brand stands for to your clients. After we have a good grasp of your business, we then move into the message and design phase. We work to create valuable clicks to your website, specifically clicks from your target market and interested parties. This can be done through stating a clear message, having appropriate imagery that conveys the right emotions, and creating a good onsite experience. With paid ad creation, your business is able to keep your brand top of mind to your customers when they leave your site. You are also able to reach more markets through online channels of common interest. Most importantly, you get a lot more impressions and exposure to drive conversions.